When a local friend presented our family with three bags of dried fish, I wasn't quite sure how we'd eat them all (or even what I'd do with them). I thanked her for the gift and then eyed the little bagged fish suspiciously. Their beady dried eyes stared back, equally as suspicious. My five year old daughter said, "Ooh those are shiny and pretty." Now, you have to understand that my daughter has always been an adventurous "try-er" of food items. Only cautious to check for peanut products, due to her allergy, otherwise she'll usually give most things a try. So, I wasn't surprised when she showed interest in trying the fish immediately. Reaching her hand in and carefully selecting "the prettiest one", she slowly popped the head of the 1/2 inch creature into her mouth, chewed and walked slowly to the garbage can to spit it out. Making a face and smacking her lips together, she said, "Hmmm. That was actually kind of good. Kind of like a gummy fish, but not really gummy and not really sweet and not really candy." She reached for a second, a third and a fourth. It was during her fifth attempt that she realized she could eat the entire fish (previously she was licking the "meat" off of the little skeleton and depositing those into the garbage bin). She's continued in her tiny dried fish eating ways for two days straight now, eating them as a supplement to dinners, for after school snacks and trying out a recipe I created for her. Tomorrow, she's requested that a few go in her lunch box. I'm a fan of the little guys for her, but can't quite enjoy the flavor myself yet. And, my three year old, a not so adventurous try-er of foods, has pinched his nose and said "pew" whenever he walks close to the air-tight container holding the fish. 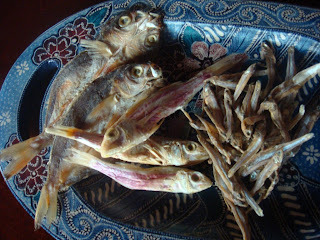 Here's a recipe, based on a traditional Philippine serving method for dried fish, that I created for my daughter. Make sure you really like the flavor of dried fish before embarking on this journey though. Mix the above ingredients together in a small container, cover and place in the refrigerator for at least one hour. (will keep well for several days, although the fish will lose their shape). Serve desired portion over hot rice as a condiment. Sawadeeka! I am drinking my coffee and checking my reading list for today. I love days when I get notice of a new post from Loving Rice. Your daughter is smart as I too love a good bit of dried fish. Will try your recipe this weekend and let you know how it goes over in my home! Sawadeeka! I've never read your blog before and found your twitter feed. I had to check out this recipe! Looking forward to reading thru your past posts. Those look grotesque. Have you tried the big flat hairy looking one yet? You need to make a friend who will bring you something better than bags of dried fish! I'm with your daughter. 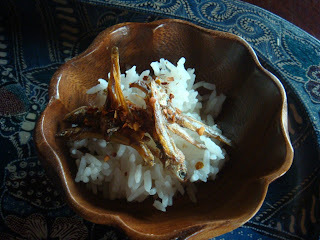 Combine dried fish with spicy and I'm sold! My husband and I are embarking on parenthood. We can only hope that our child will be as adventurous as your daughter. Nope, I would rather not try those. But I am VERY impressed with your daughter. Wow. That big one is a beast. Tell us how you (or your daughter) takes that one down the throat! Yummi dried fish :) My husband is from Mauritius (Chinese origin) and I must admit that first time I was presented with "rougaille poisson sale" I did frown, a bit. But I taste everything and this salty dried fish in a tomato sauce is hmm! I love it. My mum in law always make it when we are down there!! ok I say I taste everything, nearly haven't taste century eggs yet. Am refusing.